For years, a few days before November 29 I have begun to feel “off”. It’s weird. It’s like a sadness pervades my heart. It always catches me unaware. I awaken and feel “icky.” For years, I have questioned why I feel so out of sorts and then I look at a calendar. It never fails – it happens right before November 29. November 29 should be a really happy day. It’s my dad’s birthday. It’s the day I got engaged to an awesome guy. It’s the day I found out I was pregnant and quickly ran to the store to pick up a Willow Tree statue of a pregnant woman to tell Chad I was pregnant with our second child. All sounds great, until you know that my second child died 5 days later through an early miscarriage. I sat at a soccer game the other day with a mom I have only recently met. Within moments though, we had each shared our deepest loss – one to a miscarriage and one to an adopted child who died before she could bring him home. We sat on the grass, two mommies holding our adopted kids, and went deep into the loss and pain. All the while, we kept breaking up our stories to cheer for children living on earth to “get that ball!” We started laughing and said, “Isn’t this how life is? We are sharing our deepest pains while cheering wildly for a soccer game?” And down deep we dove again, until one of our girls had the ball! December 4 marks that sense of deep loss for me as a mom, yet also a sense of deep hope for me as a follower of Christ. December 4 is celebrated in our home as “Joy Sees Jesus Day”. We find an organization to donate soft baby blankets to and deliver them. We eat Red Velvet Cake (we just think Joy likes this kind…). And we light our advent candle of Hope and we talk about what it will be like to see Jesus someday, as our daughter and sister already has. We laugh and cry as we remember a daughter and a sister we have never met. We embrace the loss because our family loves deep. She, our little Joy, has affected us all deeply. I held her for a mere five weeks and she dug her way deep into my heart. No one else physically held her but she has impacted us all. So how can any of us live within the cycle of life with both faith and laughter? I have found four ways that have helped me over the years. Maybe they will help you too. No one can explain the burn that occurs with grief. Even as I have written this blog post, I have stopped multiple times to cry and to even gasp at the burn of grief. It just happens; it just hurts; and it just exists. But through my tears of loss, I recognize my tears contain boatloads of faith. See, I am believing in something I can’t see. Many miscarriages occur after a mom has seen the ultrasound of that tiny little figure. But I never saw it. I only saw the rupture in my ovary that revealed an egg had been released. Joy’s body didn’t hold the place or space for lungs, or kidneys, or a liver, but she was conceived and I know it because my body registered the pregnancy hormone on multiple pregnancy tests performed by me and my doctor. Therefore, she contained the image of God – a soul, a spirit, and a destiny. As tiny as she was; God is still her Creator, Her Sustainer, and Her Redeemer. My tears of loss are tears in faith that you don’t require birth to be a human, or a working heart, or a stomach that digests. You require that spark of life to occur (conception). Is that spark scientists have identified as the moment of conception the tiny image being stamped by God’s image with a soul and a spirit? I don’t know. But my tears are filled with faith because as I miss Joy I know (and choose to believe she is held by her Creator and my Redeemer). God sees those tears of faith and is pleased because without faith you cannot please God (Hebrews 1:6). Next time you weep in grief, embrace those tears filled with faith in the One you know sees and did what it took to conquer death. Right after my miscarriage, I was lying on my back in the floor. My little Joeli was on my stomach and we were rubbing noses. She laughed; I laughed. And then I cried. I would never rub noses with Joy on earth. And Joeli reached up with her 11-month old chubby arm and wiped my tears. And I laughed. Then, I cried. Then Joeli confused laughed again. As I laughed with one child, I wept for another. I look back at that day and I think God heard and saw worship. God saw through my tears faith and through my worship laughter as I enjoyed the child in my arms in my present. When we laugh in the present despite our sadness God hears the worship of hope. As my child died during the advent season of hope, laughter reminds me to hope in the future even in a difficult present or a tragic past. How can we rejoice and laugh? Because I have a child who has SEEN Jesus! My child is one in the cloud of witnesses! My child opens the door for me to share Jesus from a deep and real place with people from all different faiths. My child’s life has impacted thousands of lives through Voice for the Voiceless. Other children now live (because of Voice for the Voiceless) because Joy is with Jesus. My son Eden now lives because Joy went to Jesus. Women in oppressed situations now know that God, the Creator, gives values to women because of the curriculum written in Joy’s honor. But even as I laugh today, I cry. The ebbs and flows of life. I have chosen to see how God sees both – tears of faith and laughter of worship. The gift I have appreciated the most from people when I miscarried Joy were those who allowed me to grieve with tears and express my questions, my concerns, and my sadness. Unbeknownst to me, Chad deleted several emails we received before I saw them. Someone wrote to me and said, “You need to glorify God with your miscarriage. 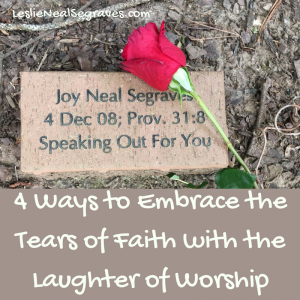 Another of my friends miscarried and immediately began to worship.” That was like a slap in the face to someone who just lost a child and thought tears were more appropriate! Evidently a few like that came and Chad wiped them clean from our computer and would never tell me who sent them! A professor and pastor wrote me soon after our miscarriage and his words carried great weight for me and brought a healing balm to my heart. He said, “I appreciate you for revealing authentic humanity in your pain of miscarriage. It ministers to me and will minister to others as they see your authenticity.” For years, I have held on to this statement. It’s through our pain and willingness to admit we hurt or have hurt that we can offer others the greatest comfort. Don’t believe that a spiritual person doesn’t feel the pain of loss or that a sense of grief means you have little faith. Far from it. Don’t demand someone grieve in a way that makes you the family member or friend feel comfortable. Don’t expect a person to move though grief on your timetable. And by all means, don’t think your refusal to name the pain or to ignore the tragedy helps the person in grief. Sometimes it simply intensifies it. When I have gone to Joy’s little brick at the National Memorial for the Unborn, there have been times I have seen a rose left there before me. From her grandmother Nana. And though I stand and weep because I see the rose, I stand in gratitude that my daughter has been remembered. Grief hits unaware. I can see baby clothes at Christmas and start crying in a store. It’s not that I don’t believe little Joy is in heaven or that I doubt I won’t see her. Rather, it’s because the loss punches you hard when you least expect it. We’re humans and we are all trying to go through this thing called life that is full of highs and lows, celebrations and blows. But we as followers of Christ have the opportunity to allow others to see that despite our pain and loss, we believe! And God counts belief as righteousness! Amidst the tears of questions or faith and around the laughter of celebration; embrace the reality of what it means to be human. And be real within it. As another person sees you walk through life scarred but hopeful in Christ, they might just find what their own broken heart has been looking for. 4. Engage in ministry that impacts life. We have found ways to honor and remember Joy’s life by serving others. Six months after Joy’s death and subsequent “Joy Sees Jesus!” I chose to give a freewill offering to God. I asked God to take my miscarriage and use it as an offering of life for His honor and glory. I felt there was some spiritual warfare around her death and asked God that if that were true to hit Satan hard through her life. I said, “I don’t want to just see her as my loss. I want to give her as an offering for Your (God’s) gain.” And God began to move and stretch and anoint and give ideas and expand His kingdom through her life! Through the Voice for the Voice Curriculum over 2000 women in Nepal alone have heard about the value of BOTH the unborn and women and the Gospel (many for the first time and from other religious backgrounds!). The curriculum is now in 3 languages and we’re working on two more. A maternity home has now been built through 10/40’s generous donors to help honor women who choose to give life. Babies have been adopted who were saved from abortion. God is now providing opportunities for us to move the curriculum that combines science with the Gospel into several other countries. Our family has a work permit in Southeast Asia because of Voice for the Voiceless. In short, our entire family moved to Thailand and gained entry here because of the death and life of Joy. By engaging in ministry on behalf of Joy, our family remembers Joy but we also see God using a tiny life to make a big difference. It’s a reminder to our entire family that God wants to use both our lives and our deaths to speak physical and eternal life to others. Only God can take our sorrow and offer hope and life through it. Find ways to honor your loved one by helping someone else. God uses that to heal. And in the midst of that ministry, your tears of faith and your worship-filled laughter will flow! Tonight our family will deliver baby blankets to a new orphanage in Thailand in Joy’s honor. We will eat our Red Velvet Cake. We will light our advent wreath candle of hope and talk about what Joy might be doing now, and what it will be like when we see her and Jesus someday. There will be tears; there will be laughter. We will be a family with the candle’s light flickering off our wet cheeks and sparkling eyes as we remember and hope. I think in the midst of it all, Jesus will watch with our little Joy and together they will appreciate our tears of faith and our laughter of worship. They will both be honored as they watch us messy humans living in a messy world clinging to the hope offered by Jesus. Tonight I anticipate the sacred table my family on earth will share with my family in heaven watching.